Massive Volcano Eruption: All European Airports Closed. It turns out that the eruption happened while we were in the air. We landed at 10:00am. By the end of the day, all the airports were shut down… for several days. We were lucky to get there! 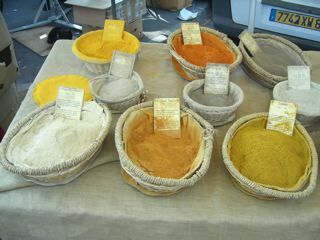 Our first destination was Arles, France. Arles is a beautiful, sleepy town full of medieval streets and Roman ruins. For such an amazing place, it’s wonderfully non-touristy. It’s just off the Mediterranean, a few hours from Italy… and you can really feel the Italian spirit in the streets and the relaxed lifestyle of the people there. 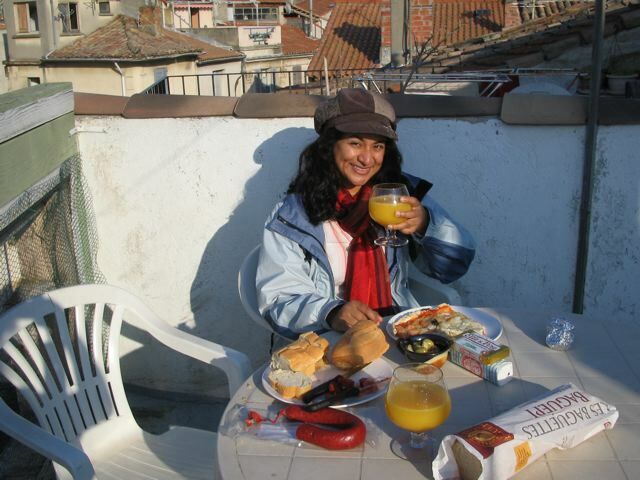 Every house has a rooftop terrace, perfect for some wine, cheese and olives in the afternoon. So civilized! This time around, we decided to travel “Slow Style”. Instead of dashing from place to place, “doing” the main attractions, and sleeping in hotels, we chose to settle somewhere for a few days and allow ourselves to fall in love with a new place. To this end, we decided to do short-term apartment rentals. Our place in Arles was booked through a private-accommodations website called Homelidays.com. For the price of a hotel room, you can have a full-sized, furnished apartment with kitchen, laundry, and in Arles, the requisite rooftop terrace. Instead of feeling like a transient in a hotel, living out of a suitcase, you can settle in and pretend you live in a new place for a while. A real home-away-from-home. Our first stop when traveling slow-style is food shopping: we always eat breakfasts at “home”, sometimes lunch, and usually a few dinners. 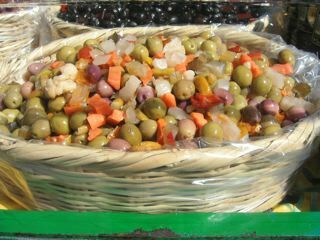 Food shopping in a new place is always fun: you get to check out what local people eat. 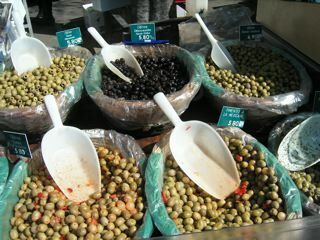 The farmer’s market was amazing: row upon row of fresh fruit and vegetables, all local, a million different kinds of cheeses, and sellers who offered nothing but olives…dozens of different kinds. 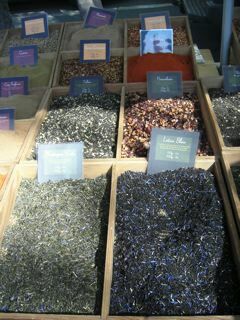 They also had just about everything else: clothes, antiques, soap, herbs, anything you could think of. In Toronto, you have to search out markets like these. In France, they’re par for the course. This is their supermarket. We spent about a week here prior to our first concert, sightseeing in the town and in the surrounding areas (Avignon, Beaucaire/Taviscon and Nice), and completely fell in love with this little part of the world. A picture is worth a thousand words: check out this photo album to see what it was all about. Chapter Two: Concert, Workshops and More Travel Drama! Our trip to Nice was, well, nice. But, it took us all day to get there. Our train was stopped for nearly two hours. We didn’t know why… until Suba overheard (in French) something about someone “falling on the tracks”. Dylan then saw the rather gruesome sight: police, complete with crime-scene props, and the dead body on the side of the tracks, covered up. Accident? Suicide? Something more sinister? We never found out. Thanks to the volcano and other disasters, our travel plans were a little disrupted. Fortunately, once we arrived in Europe, we decided to travel only by train. Train travel is so much more civilized. No long cab rides to a remote airport: no check-in lines, no security checks, no get-there-two-hours-ahead. With train travel, you show up a half hour ahead (to the train station, in the centre of town), find your train, and hop on. Once you’re on, you stretch out (no herding in like cattle), relax, and enjoy the scenery. If it’s a long enough trip, mosey on down to the dining car. All in all, you can have a 12-hour travel day and not feel tired at the end. Assuming it all works out. Sometimes, it doesn’t. Due to the volcano, the train we wanted to take was full. Instead of an early-morning day train, we had to take a later overnight train. This meant rescheduling a workshop we were to give that night, shifting our next workshop the next day, and arriving to the concert hall later than planned. No problem, so far. Until the fire at the train station. Lucky for us, we weren’t there to see it: it was somewhere between Lyon and Dijon (maybe it was the flammable mustard). All we knew was that we were, again, two hours late to arrive at our next stop. Which meant missing our connecting train, stranded in Strasbourg until the next one arrived. By this time we were pretty tired (overnight trains travel veeeeryyy slowly), and scrambling to make it to our first concert. We arrived with 45 minutes to spare, and soundchecked as the audience was arriving. 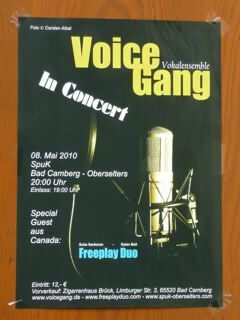 Despite the franticness of it all, we gave a pretty good concert, as “guest artists” with the German all-female a cappella group Total Vokal. The gals from Total Vokal. Ain’t they gorgeous? What was supposed to be a leisurely day-and-a-half-long workshop and concert in Kassel turned out to be a 12-hour whirlwind. We left on an early morning train the next day for Venice, Italy. Venice was our home base for meeting some old friends and colleagues: our dear friend Kevin Fox and the rest of the world renowned UK vocal group the Swingle Singers. They had a concert in nearby Pordenone, and so we decided to attend said concert (on what happened to be Dylan’s birthday). The entire audience sang Happy Birthday as informally conducted by Foxman. The concert was wonderful, featuring many of the new arrangements on the Swingles’ latest album, Ferris Wheels, produced by Dylan. We had a great time catching up with our friends in the Swingles. We stayed with them overnight before heading back to Venice with Foxman and fellow Swingle bassman Tobi Hug. 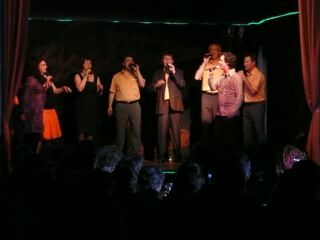 The Swingles and FreePlay Duo, clockwise from left: Lucy, dB, Clare, Sara, Joanna, Paolo (concert presenter), CJ, Tobi, Suba, Richard, and sound-engineer Hugh. Venice is a postcard on water. It’s overwhelming in that, everywhere you look, it seems that a picture should be taken to capture the moment. We took a million photos: here is a small selection. More travel drama. We started out early with a train to Milan to take us to Zurich. 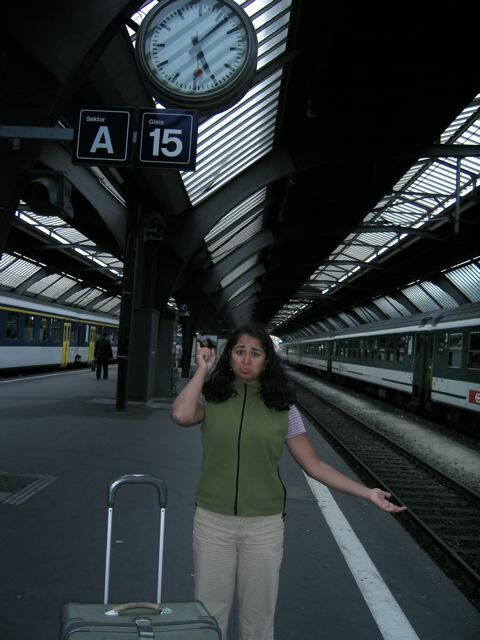 We had 19 minutes to transfer trains… but the train from Italy was 20 minutes late. We watched the backlights of our connecting train as it left the station. Dylan went in to the ticket office to find another train. The prim-and-prompt Swiss train attendant remarked, eyes rolling: “you were on the train from Italy, weren’t you… same [expletive], different day…”, indicating in one sentence the cultural divide between Switzerland and Italy. We now understand why one country makes clocks and precision instruments, and the other makes olives and wine. We made it to Germany eventually… around 1am. After a 17-hr travel day, our hotel room felt like heaven. Chapter Four: Workshop with Maybebop… and the “ohrwurm”. The next day saw us traveling to Hannover (on time, thank goodness) for a workshop with Germany’s premiere a cappella group, Maybebop. We had a great time working with the guys: they’re excellent musicians and arrangers, and great showmen. We worked on music that covered everything from beatboxing, to South Indian ragas (for an original song about a Mike Meyers-esque “fake guru”), to a re-arrangement of Mussorgsky’s “Pictures at an Exhibition” with new lyrics about the pretentiousness of modern art, to a country song about a man in love with his cow. 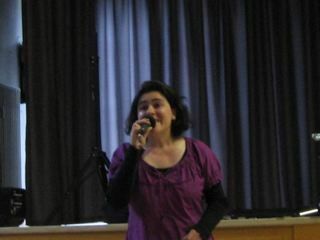 It was a fantastic workshop, and great to hear what amazing vocal groups Germany has to offer. 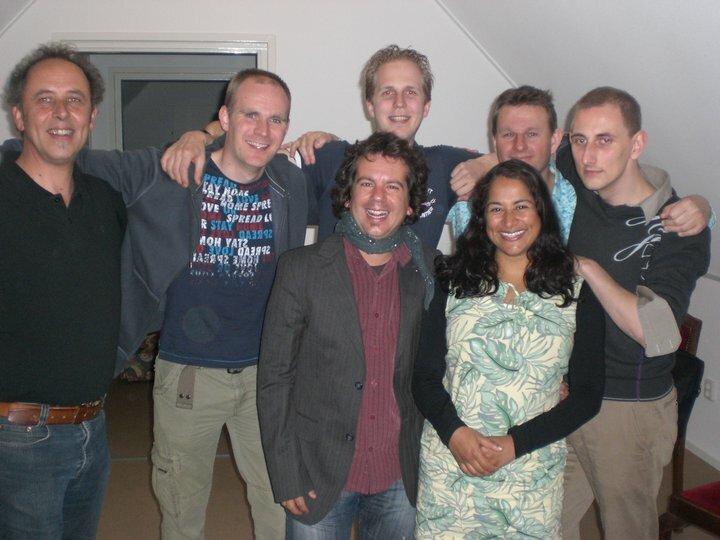 Oliver Gies (the one with the glasses) is also a well-known arranger. 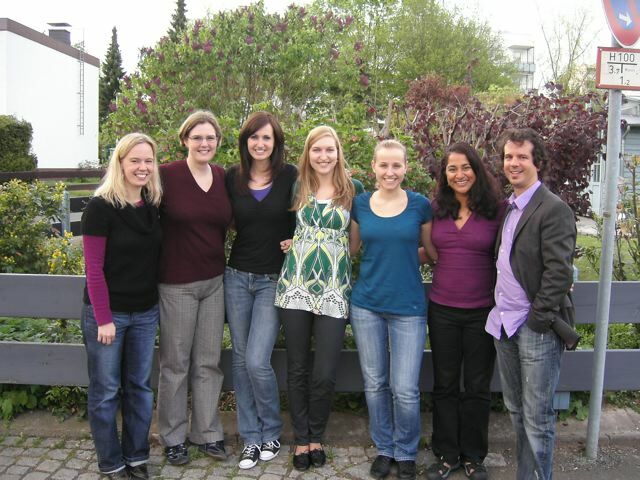 It turns out that one of his arrangements, a clever, quasi-classical arrangement of a German heavy-metal song, was a test-piece for an upcoming German a cappella competition. Over the next week, we worked with no less than three different groups, all doing the same piece! We couldn’t stop singing it for weeks afterwards. The Germans have a word for this: “ohrwurm”. It translates as “ear-worm”… a song you can’t get out of your head. Thanks a lot, Ollie! We went back to Kassel from Hannover to do our rescheduled workshop (thanks to the aforementioned train drama) with Total Vokal. We did some vocal technique, taught a lovely round, and worked on a couple of songs. They were excited to be opening for Maybebop later in May and decided to polish a few songs in their existing repertoire. The gals in Total Vokal are always so friendly, hospitable and Kathrin still makes the greatest homemade cakes we’ve ever encountered (chocolate or no chocolate!). Chapter Five: MacGyver and Baby Sharks! After the workshop with Total Vokal, we were picked up by our dear friends Thorsten and his wife Ghislaine. 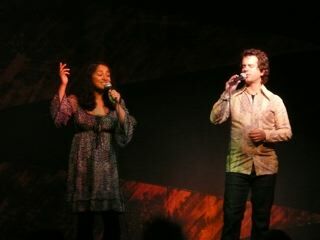 Thorsten directs several choirs and he and Ghislaine have their own duo called Entre Nous. We spent a fine evening with them catching up and rehearsing in Thorsten’s amazing attic studio. 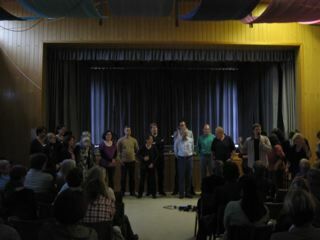 The following day, we did an all-day workshop with members of Thorsten’s choirs. 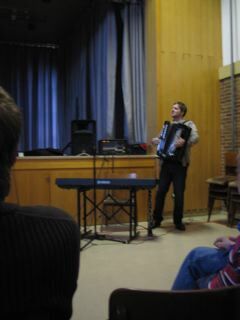 We followed this with a concert featuring Entre Nous, the FreePlay Duo and the choirs. The choirs sounded great and Entre Nous was charming and beautiful. Ghislaine has a lovely voice and Thorsten demonstrated his multi-instrumental skills on piano, accordion, voice and clarinet through their beautiful renditions of French chansons. We followed the concert with a late-night dinner, where the owner of the restaurant showed us something very interesting. In his aquarium was what looked like a small fish: he told us it was a baby shark that was born just two hours before, sometime during our concert. Thorsten followed this with an off-colour joke comparing sharks with sopranos, proving that choral humour is indeed universal! During our travels, one of our pieces of luggage suffered a broken handle. Thorsten took one look, smiled, and said, “Watch this: I’m MacGyver!” He then repaired the handle with some spare wire and duct tape. He told us it would survive our trip to Amsterdam. Thorsten, you’ll be glad to know that the bag made it all the way to Amsterdam… then Frankfurt, Paris, and back to Toronto, still intact. Our next stop was Amsterdam and our timing was interesting. We arrived just in time for Holland’s Remembrance and Liberation Days. We were reminded of Canada’s role in liberating Holland when we saw Canadian flags draped in several restaurants. To celebrate Liberation Day, the local rep cinema was showing a special presentation of Quentin Tarantino’s Inglourious Basterds, a movie set at the end of WWII. Since most American movies are shown in English with subtitles, we figured we would have no problem understanding the movie. In turns out that most of the movie is in German and French (and some English) and is shown in Canada with English subtitles. However, since the subtitles turned out to be Dutch, we had an amusing time piecing together the story by searching for familiar words in three different languages! We’re pretty sure the Allies won. Our next day was a long day of seminars, workshops, and private lessons, hosted by Nathaly Mascle in the small town of Vorden. We had an enjoyable time giving lessons on how to use the loop station as well as helping choir directors with their choral arrangements, and a workshop with the Dutch a cappella group KeK. 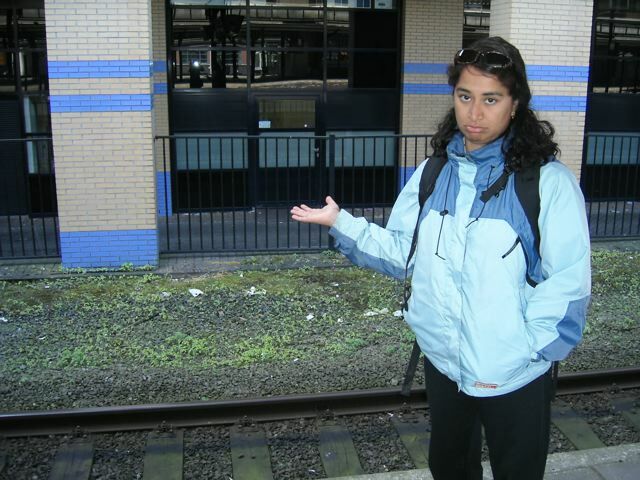 We had an amusing time navigating the Dutch suburban train system, but eventually made it back to Amsterdam. Dutch confusion… without even sampling Amsterdam’s famous wares. Going back to Amsterdam? Wrong way! We left Amsterdam for Frankfurt, and were greeted by our dear friends Uli and Bruno, members of Voicegang. That evening, we did a short workshop with Voicegang: we worked on two of their pieces, and taught a simple version of Bob Marley’s “Three Little Birds”. 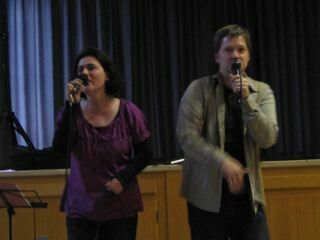 This was followed by a joint concert with Voicegang and the FreePlay Duo, and we sang Three Little Birds as the finale. A writer from a local newspaper wrote a very nice review. Here is a rough translation of the FreePlay Duo’s portion of the review. We also had a “small-world” story. Last September, Suba and Dylan performed in Hamburg, Germany while on tour with Autorickshaw, and Suba made an impromptu guest-appearance with the guitarist Torsten de Winkel. Suba and Torsten have been in contact since, and when Suba mentioned our concert with Voicegang, Torsten wrote back, saying “I live only 60km away! I’ll see you there!” We had a nice time catching up after the concert and hope to work with him again soon. The next day was a full day of workshops with two of Uli’s choirs… followed by a fantastic bar-be-que. Dylan was in BBQ heaven, and Suba found a “vegetarian sister” with spare tofu-dogs. The only two vegetarians in Germany… under one roof. When we tour Europe, all our hosts are wonderfully accommodating… but Uli and his crowd stand out. Knowing how exhausting touring and performing can be, one of the members of Voicegang, Britta, offered up her apartment to us. What we didn’t realize was that she offered the whole place… she went off to sleep somewhere else while we were visiting! Britta, we got the best nights of sleep on our whole tour in your beautiful apartment. Uli and some other Voicegang members saw us off with a nice, leisurely brunch at Britta’s place, and drove us to the train station. Uli told us that he wanted to host us well to ensure that we would come back. Rest assured, Uli…we’ll be back! Our next stop was nearby Kassel for our rescheduled workshop with Vokus Pokus. The workshop was going smoothly until the janitor of the building kicked us out of the room early. We finished the workshop huddled around a streetlight…classic street-corner a cappella. Next was the overnight train to Paris. Although we had a Eurail train pass, we had to make reservations for the sleeping car…and were surprised at how expensive it was. We soon discovered why: instead of the usual 6 beds per room, we were given a private cabin with two beds, our own washroom and shower and room-service breakfast and coffee! Thank you, Eurail, for the surprise burst of unexpected luxury. First class, indeed! All in all, it was an amazing trip. Touring Europe is fast becoming an annual FreePlay Duo tradition: it is the highlight of our year as we reconnect with old friends, make new ones, and share our music through performance and education. A final shout-out to all of our many gracious hosts: Sybille and Total Vokal, Lukas and Maybebop, Thorsten and Ghislaine, Uli, Helga, Bruno and Britta and Voicegang (and Andreas and family! 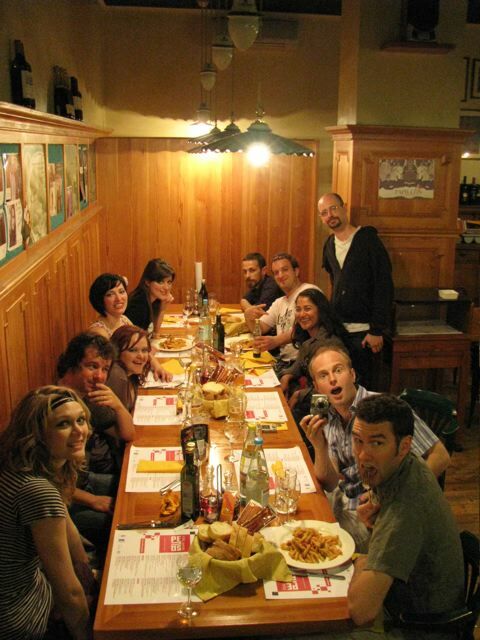 ), Nathaly and the rest of the Holland gang, Susanne and Vokus Pokus, Fox, Tobi and the Swingle Singers. We can’t wait to do it again next year! This entry was posted in Touring and Travel. Bookmark the permalink. ← Welcome Home, Baby (grand).